The port city of Mangalore is situated at the source and confluence of two rivers Netravati and Gurpur. It derives its name from Queen Mangaladevi who according to tradition, is said to have lived here in the tenth century AD. St. Aloysius Chapel: It has marvellous murals covering its walls and ceilings. Kadri Manjunatha Temple : The temple on Kadri hills is dedicated to Lord Manjunatha. There is also a 'Matha' here of the Jogis of the Natha Pantha. Mangaladevi Temple : A Sakti temple which gives Mangalore its name. Sultan's Battery : This is a watch tower built by Tipu Sultan. Srimanthini Bai Memorial Government Museum : Located in the Srimanthini Bhavan, it has a collection of art, archaeological and ethnological exhibits and natural history specimens. Timings: 0900 to 1700 hrs. Closed on Mondays & Wednesdays. Ullal(13 Km. ):A lovely beach just outside Mangalore,Ullal is famous for its silvery sands. Accom:Summer Sands Beach Resorts, Ullal, Tel: 467690(Rs.810-1170/-). Surathkal (20 Km.) 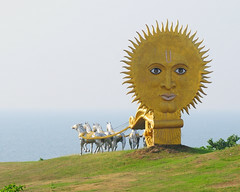 : Famous for the Sadashiva temple on top of a rocky hill on the sea shore, and also has a fine beach. An annual car festival is held in December. Bajpe (25 Km.) : The Mangalore airport is located at Bajpe,which also has a waterfall. Kompadavu (25 Km. ): This small village is famous for the Nelli Theertha Somanatha Temple. : Famous for the Narasimha Temple.The deity of the Janardhana Temple in Sinantur, 5 Km. from Mulki, was the family deity of the Savantas. Katil (30 Km.) : Katil has a temple dedicated to Durga Parameswari. Karinthe (35 Km.) : This rock temple situated on top of a small hillock is dedicated to Shiva as Karintheswara. Mudabidri (36 Km.) : It is known as the Jaina Kashi of the south. There are 18 Jaina bastis here. The Jaina Matha here, has rare manuscripts of 'Dhavala' and 'Jayadhavala' two great Jain texts. Accommodation: Tourist Cottages of the Department of Tourism, Govt. of Karnataka and a PWD Inspection Bungalow. Karanje (37 Km.) :The holy place of Karanje, well known for it's Shiva temple, is situated on a hill 1,500 feet high and commands a panoramic view of the surroundings. Venur (55 Km.) 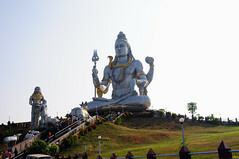 : Famous for the 9 metre high statue of Gomateswara. Considered as one of the seven sacred spots of the region, Udupi is famous for the Krishna Temple. The Krishna idol was installed by Madhwacharya, the propunder of the Dwaitha philosophy and all the eight 'mathas' founded by him, have their headquarters within the temple square. The Parayaya festival which is the most important festival of the temple is held once in two years usually in January when there is a ceremonial change of title of the head priest of the Madhwa matha. Accommodation : The tariff of the following hotels ranges from Rs. 200-300/- for a single room and Rs.300 - 500/- for a double room. Hotel Janardhan, Tel: 23880, Kalpana Residency, Upendra Baug, Udupi-576101.Tel: (08252) 71021. Hotel Karavali,Tel: 22861; Hotel Kediyoor, Tel: 22381; Hotel Mallika, Surekha Bldg., K.M. Marg, Tel: 21121. Hotel Shah, Tel:23901, Hotel See Ramakrishna Lodge,Tel:23189, Hotel Sindhu Palace, Tel: 20791, Hotel Tourist, Tel:20641, Hotel Usha, Tel: 20021, Hotel Woodlands, Tel: 20662. Other Accom: Choultries and rooms maintained by the Sri Krishna Mutt, Udupi. PWD Inspection Bungalow, Udupi. Resvn: The Executive Engineer, PWD, Udupi. Belthangady (60 Km.) : There is an old Somanatha temple made of granite, a Venkatarama temple, a Jain Basadi and a ruined fort in Belthangady. Manipal (61 Km.) : Manipal is a progressive educational and industrial centre with well known medical and engineering colleges. There is a modern Venugopalakrishna temple built in 1973 and a museum in memory of Dr. T.M.A. Pai, the architect of the township. Karkala (62 Km. ): A Jain pilgrim centre, it has a huge 42 feet tall monolithic Gomateswara statue. The beautiful granite Chaturmukha Basti, the temples of Anantasayana and Venkataramana, the old palace of the Bhairarasa Wodeyars are the other notable monuments here. Accommodation :Tourist Cottages, Dept. of Tourism, Govt. of Karnataka, Karkala, PWD Inspection Bungalow, Karkala. Malpe (63 Km. ): Malpe has a lovely beach ideal for sun and sea bathing and boating. 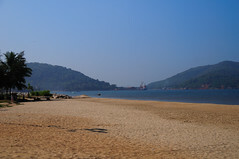 Saint Mary's Island (68 Km. ): A group of small islands lying north of Malpe port are noted for their basalt rocks which have crystalised into columns and split into hexagonal mosaic. Boats are available from Malpe to St. Mary's Island. Dharmasthala (75 Km.) : This popular pilgrim centre is an outstanding example of religious and cultural tolerance. Dharmasthala derives its sanctity from it's temple dedicated to Manjunatha. The striking feature of this Shiva temple is that the priests are Madhwa Vaishnavites and the family of the Heggade who is the Dharmadikari of the place, are followers of Jainism. 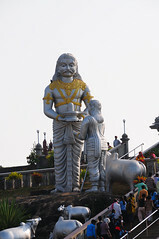 There is also a huge monolithic statue of Lord Gommateswara, a Jain saint here, which was installed in 1973. The Manjunatha Temple authority has boarding and lodging facilities for visitors and thousands of devotees thronging the temple are fed free of charge, irrespective of caste and creed. Kudremukh (102 Km.) : Known for India's largest iron ore project, Kudremukh is also famous for its splendid scenic beauty. 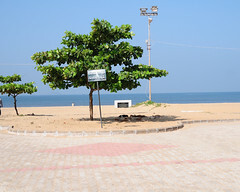 Maravanthe (103 Km.) : 16 Km. north of Kundapur, it has a lovely beach. Kundapur (104 Km.) : The name of the town can be traced to the Kundeswara temple built by Kundavarma, close to the Panchagangavali river. 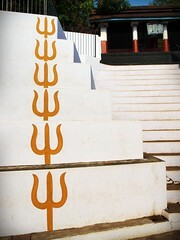 There is another temple dedicated to Mahalingeswara. The Portuguese built a fort here in the 16th century and called it Barcelore. Accommodation is available at a PWD Inspection Bungalow. Subramanya (104 Km.) : One of the seven sacred places in the region, Subramanya is famous for the temple dedicated to Lord Subramanya worshipped in the form of Naga (serpent). Other shrines of this temple are those of Lakshminarasimha and Umamaheswara. An annual temple festival is held in November-December. Kollur (146 Km.) : 88 Km. from Udupi and 42 Km. from Kundapur, Kollur is famous for the temple dedicated to Goddess Mookambigai. The image of the goddess was consecrated by Adi Shankaracharya. Accommodation : Souparmika Guest House, Old Guest House, Ordinary Rooms. Resvn:The Exec.Officer, Mookambigai Devasthanam, Kollur. Dakshina Kannada, Tel: (08254) 58221. Ambika Guest house, Tel: 58220, Annapurna Guest House, Tel:58246, Bhavani Rest House.,Bhagirath Tourist Home, Devi Krupa, Tel: 58274, Sri Ramakrishna Yogashram Ashram,Tel:58223, Yamuna Vihar Tourist Home, Tel: 58229. Sringeri (152 Km.) : Sringeri is famous as the 'matha' of Jagadguru Shankaracharya, the founder of the Advaita philosophy. The Sharadamba Temple here was founded by the Shankaracharya himself. The other places of interest in Sringeri are a Jain basadi dedicated to Parsvanatha and the beautiful Vidyashankara temple. Kigga, 8 Km. from Sringeri has a temple dedicated to Rishyashringa and an old ruined fort. KSRTC and private bus services connect Sringeri with Agumbe (26 Km. ), Bangalore (326 Km. 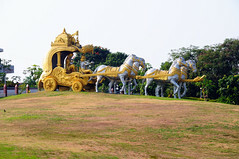 ), Belur (104 Km. ), Hassan (141 Km. ), Kollur (132 Km. ), Mangalore (152 Km. ), Mysore (259 Km.) and Shimoga (140 Km.). Accom: Sankara Krupa, Sankara Niketan, Jai Shankar Niketan, T.T.D. Choultry, Sharada Niketan. Six halls (each hall can accommodate 50 to 60 persons). Reservations :The Administrator, Sringeri Mutt, Sringeri. PWD Travellers Bungalow, Sringeri. Resvns:The Assistant Executive Engineer, PWD, Sringeri. Jog Falls (225 Km.) :The famous Jog Falls are about 16 km. from Talguppa, the railway terminus on the Birur line. Jog is 104 km. from Shimoga, 256 km. from Belgaum, 348 Km. from Mysore and 378 km. from Bangalore. Bus services connect the Jog Falls with Bangalore, Mangalore, Bhatkal, Karwar, Hubli and Shimoga. The Gersoppa Falls, commonly referred to as the Jog Falls are one of the highest and most beautiful in India. The falls are formed by the descent of the river Sharavathi down a chasm 256 metres deep. The water falls in four cascades namely the Raja or Monarch, Roarer, Rocket and Rani, presenting a scene of grandeur and sublimity. The Mysore Power Corporation releases water to the Jog Falls on every second sunday of the month. Accom: Hotel Mayura Gerusoppa, KSTDC Tel: (08186) 4732 Tariff : Rs 150 - 300/-.Accommodation also available at Inspection Bungalows, Guest House, Youth Hostel and a few private hotels. Gokarna (227 Km. ): Gokarna, a pilgrim centre 56 km. from Karwar is famous for the temple of Mahaballeshwara which for devotees is next in sanctity only to the Varanasi Vishwanath temple. Accom: Hotel Mayura Samundra KSTDC, Tel: (08386) 56236 Tariff : Rs.125- Rs.190/-. Gokarna also has an Inspection Bungalow which can be reserved through the Assistant Engineer, PWD, Kumta. Karwar (261 Km. ): Karwar, the district headquarters and port town, situated in Uttara Kannada, traces it's history to the time of Arab traders. 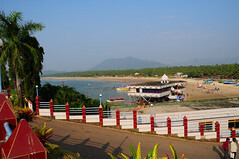 With a chain of five islands protecting it from storms, Karwar is famous for it's beautiful stretch of sandy beaches. Places of interest in Karwar are the Sadashivgad Hill Fort with a Durga temple, the Dargah of Peer Shah Shamsuddin Kharobat - a Baghdadi saint and the Octagonal Church at Sunkeri. 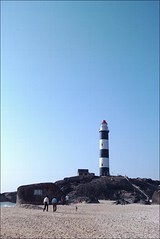 A visit by launch to the Kurmagad Island which has an old fort and a Narasimha shrine is an added attraction. Accommodation in Karwar is available at an Inspection Bungalow, Tourist Bungalow and Circuit House. Area : 121 Sq. Km. Altitude : 213 Metres. Temperature : Summer Max: 31.0 Deg.C. Min: 26.0 Deg.C. Winter Max: 28.9 Deg.C. Min: 18.3 Deg.C. Best Season : October to February. STD Code : 0824. Rail : Mangalore is connected by rail with major cities and towns . Road : Mangalore is well connected by road with Bangalore 365 Km., Belur 265 Km., Cannanore 132 Km., Hassan 180 Km., Karwar 212 Km., Kollur 119 Km., Madikere 135 Km., Manipal 61 Km., Mumbai 988 Km., Mysore 265 Km., Sringeri 130 Km. and Udupi 60 Km. Hotel Srinivas Rs. 375-500/- Rs. 475- 675/- Ganapathy High School Road, Tel: 440061-70. Post Box No.592,Kankanady, Tel: 439203-08. The tariff of the following hotels ranges from Rs.250/- to Rs.550/- per room per day. Hotel Adarsh, Market Rd., Tel:440878; Akbar Hotel, Market Rd., Tel: 441609; Hotel Dhanyavad, Tel: 440066; Hotel Ganesh Prasad, Tel: 440418; Hill Top Hotel, Court Hill, Tel: 443726/27/443028/29; Hotel Indraprastha, Lighthouse Hill Road, Tel: 425750/423756/4757/1758; Hotel Manorama, K.S. Road, Tel: 440306-11; Hotel Navratna, K.S.R. Road, Tel: 440520-23/440744/45/47/48 ; Hotel Pancha Mahal, Tel: 496004; Hotel President, Old Nehru Maidan, Tel: 422391; Priya Hotel, Tel: 427975; Hotel Rajdhani, Nilgiris Road, Tel: 51631; Hotel Roopa, Hampankatta, Tel: 421271-79; Hotel Sapthagiri International, Tel:481672-78 ; Hotel Shaan Plaza, Tel: 440312-19; Hotel Sujatha, Tel:440251 ; Hotel Taj Mahal, Hampankatta, Tel: 421751/423752 ; Hotel Usha, Tel: 423234; Hotel Vasantha Mahal, Hotel Venkatesh, Tel: 440793; Hotel Woodlands, Bunt's Hostel Road, Tel:444754/3755/, Woodside Hotel, Tel: 440296-99. Kadri Hills, Tel : 211192. Dormitory Rs. 45/- per bed. PWD Circuit House, Kadri Hills, Tel: 212286. Information Counter, Dept. of Tourism, Hotel Indraprastha, Mangalore. Tel: 421692. Hotel Mayura Netravati, Kadri Hills, Mangalore-575004, Tel: (0824)211192. Karnataka Tourism Information Centre No.3, World Trade Centre, Cuffe Parade, Mumbai. Telefax: 2181658.